Whether she is cruising Bayshore Boulevard by day or the life of the party by night, anywhere you spot Frankie, you just can’t wait to join in her fun! 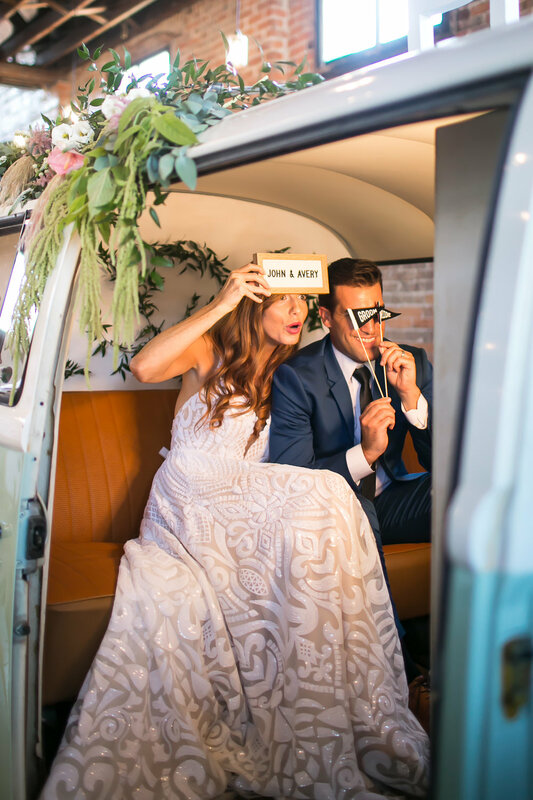 Frankie is a foxy 1976 Volkswagen Transporter Bus transformed into a trendy modern-day mobile photo booth that will bring a dreamy, nostalgic vibe to any event! From whispering sweet nothings while cuddled on her seat away from prying eyes, to dancing in the moonlight outside her twinkling mint exterior - whatever the occasion - the photos you capture with Frankie and her plentiful props will bring you memories that last a lifetime. Stolen kisses, dancing under the stars, celebrating true love - we love weddings! Frankie will add delight and whimsy to your special day, and her photos will make the perfect gift to thank your friends and family for celebrating your day with you. Our premium custom guestbook makes the perfect add-on for you to keep a record of the fun your guests had during your reception. Private parties are a great opportunity to meet Frankie! She would love to hang out with you and your guests, providing lifelong memories with each snapshot. Whether it is a birthday party, bridal shower, baby shower or celebrating how fabulous you are, we provide a one-of-a-kind experience that your guests will be talking about for years to come. Hiring Frankie to add some vintage fun to your corporate event doesn’t just show your attendees how much you appreciate them, it provides a fantastic opportunity to promote your business on social media! Each photo taken with Frankie can be uploaded during your event through your provided WiFi connection, or via the photo gallery link you will receive within 24 hours of your event. A one-of-a-kind experience where vintage meets modern with a unique twist on the classic photo booth that you and your guests will love. Grab a prop, a few friends, kick-back and strike a pose. Although our bus has a sweet, vintage feel, the equipment used to capture your photos is nothing but state of the art. We use the latest photo booth software, high quality DSLR camera and lens, as well as advanced printing equipment that will create photos that will last as long as your guests memories of the event. Frankie will make the perfect addition to your shorter event when you select the “Make it Snappy” package. For this two-hour package, you and your guests will have no limit on how many times you can come back for more photo fun. This includes unlimited customized photo strips, as well as social media sharing and digital copies uploaded to an online gallery. Your guests will be over the moon with Frankie when she is set up for your event with the Backseat Booth package. We are pulling out all the stops with this four-hour bundle. In addition to all that you receive in the “Make it Snappy” package, set-up for the event will be completed one hour prior to the start of your event, giving you plenty of time to include her in your event design plan. Frankie loves road trips! The “Smiles for Miles” package includes everything in the “Backseat Booth” package, but Frankie comes to you wherever you are hosting your event within two hours outside of her normal service area (Tampa/St.Petersburg). All travel fees are included. Interested in booking the bus? We would love to join you for your upcoming event. Give us a shout by filling out the form and we will be in touch soon! Thank you for contacting Sweet Shot Photo Booth Bus!! We will respond to your email shortly. We look forward to chatting about your upcoming wedding, event or party! !